Last month, I wrote about the thick, fusing branches of Acropora austera. This month, I present another thickly growing SPS, the beautiful A. efflorescens. The “efflo” as is frequently called in the aquarium trade, is a plating coral that is rare by SPS standards, growing natively mainly in the North Indian Ocean and indo-Pacific in a range that wraps around Indonesia, Malaysia, and the southern tip of India around Sri Lanka. While similar in overall shape to A. branchi and A. clathrata, Efflo’s have a very distinctive growth pattern, forming massive plates with low, tightly bunched corallites. In fact, they are one of only a few SPS species where there is no discernible difference between radial and axial corallites.1 From a taxonomy perspective, there is some disagreement among the scientific community about the validity of A. efflorescens being a truly unique species of Acropora. Some taxonomic sources cite that A. efflorescens is actually A. cytherea.2 There is little doubt that future genomic testing will reveal the true answers, but for now it is important to note that Acropora experts are divided on this. A. efflorescens typically grows in the wild on reef slopes where there is constant moderate-to-strong current. 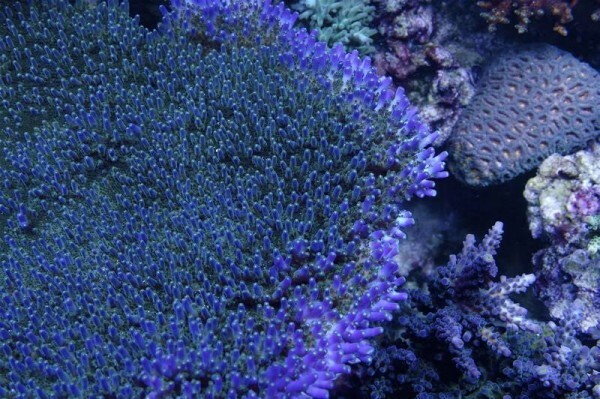 In captivity, the corals require fairly strong flow (both to keep it growing well and keep detritus from accumulating on its large, flat plating structure). It is my experience that mid-tank placement with strong lighting typical of SPS systems will create the optimal environment for A. efflorescens. As every system is different, you can expect varying results with changes in flow or lighting levels and spectrum. I also have found that this species appreciates high-quality water conditions and will reward the aquarist who can maintain stable levels. Back in 2004, a particularly beautiful specimen of A. efflorescens was purchased for $500 and from then on, that particular coral (and its descendents) became known as the “500 dollar efflo” 3. Several pieces of this original coral are now being kept and aquacultured by hobbyist and retailers across the U.S. I was fortunate to obtain one of those descendents which is pictured in figure 2. Another well-known (and highly desirable) specimen of A. efflorescens is owned by Greg Carroll. Nick-named the “Ultimate efflo”, it is a wonderful example of just how gorgeous this coral can be in captivity. As the story goes, Greg purchased the original coral from a wholesale outlet in California and grew it into the mammoth colony pictured in figure 3. As with many SPS species, the needs of A. efflorescens change over time. As the coral grows larger, you must be prepared for the consequences. It is generally a slow grower, and will take some time to become the massive plating monster you dream of, but you should plan accordingly. Due to its horizontal plating structure, it will shade everything underneath it. Likewise, depending on placement in your system, it may create significant impediments to water flow. You will need to ensure that the coral continues to get adequate lighting and flow across it as it bulks up. 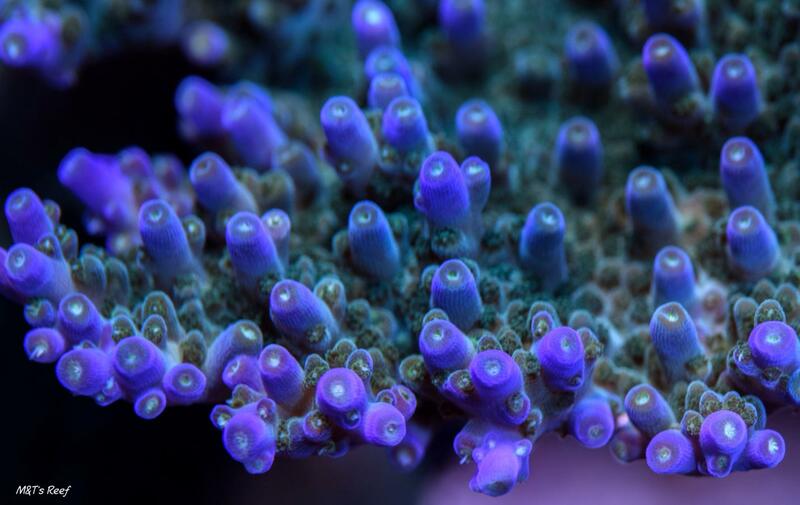 A. efflorescens is one of those SPS species that can be your “show piece” or the focal point of your reef aquarium. 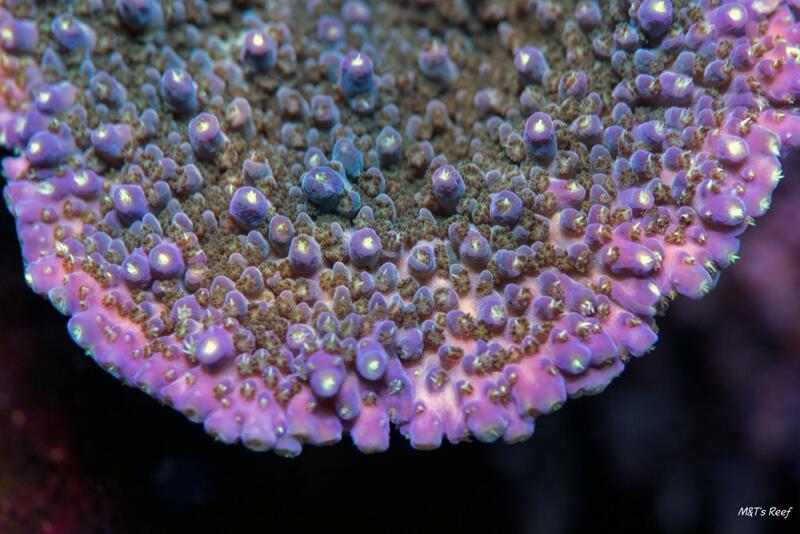 The coloration, shape, and texture of it is very attractive and unique among hard corals. While not necessarily easy to find or inexpensive, if you are patient and save up your money, you can usually find a nice aquacultured piece. 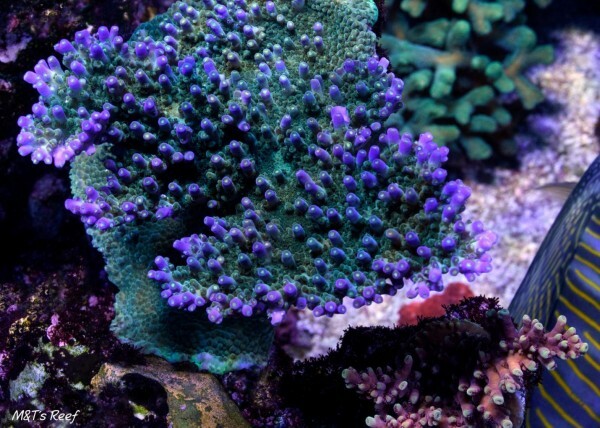 Wild colonies can be an exciting thing to find, but bear in mind that they can be very challenging to successfully acclimate and should not be attempted by the novice reef keeper. A. efflorescens can be demanding and difficult, requiring expert husbandry, but oh so worth the effort. Click here to ask a question or to read more discussion in our SPS Forum.